FREE - Fun Math Worksheet Activity - Magic Trick with Number 9. Premise: After a few basic calculations, students will secretly circle a number and you will correctly guess it. 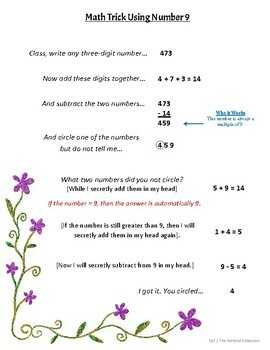 This freebees printables worksheet activity works nicely for mental math practice. It takes a couple times to get the hang of it and works because of number nine's properties.